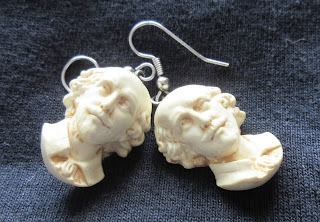 If you see me around school in the next several weeks, I’ll probably be sporting a Shakespeare t-shirt, plus my bust-of-the-Bard earrings (which are frequently mistaken for skulls at a distance—I've learned to clarify that early on). Tenth grade Honors English has started A Midsummer Night’s Dream, and it's time to really put my inner nerd on display. “Where did you get all those t-shirts?” the kids asked when I told them I had a pile I'd be wearing throughout the unit. Each one has its story (sometimes several layers of stories), and I’ve promised the story of each as I wear it. The Globe Theater t-shirt is my oldest. I got for myself on my family's visit to England when my daughters were 7 and 9. (I can also tell the story of seeing Hamlet as a groundling at the Globe, as well as other stories from that epic trip!) The white shirt shows scenes from The Tempest outlined with text from act 1, scene 1—a gift later in life from my older daughter, commemorating the first Shakespeare play I ever took her to, when she was in 5th grade. It was the Royal Shakespeare Company at the Tokyo Globe Theater, and I took her because she had done her massive 5th grade research project on Shakespeare. (The earrings are also from her—picked up at the Oregon Shakespeare Festival on her honeymoon.) The one with Robin’s most famous line from A Midsummer Night’s Dream was a gift a colleague brought back from her own pilgrimage to The Globe. Finally, the Bard’s head, constructed from the titles of the 37 plays he wrote, was a gift from my younger daughter, acquired on a recent visit to the Oregon Shakespeare Festival. Some may say my whole family suffers from nerdiness, but they're wrong--it doesn't hurt at all. Finally, I wear my book-loving nerd all over my classroom door. (I’m printing these posters for every secondary teacher at my school as part of the weekly sustained silent reading program we instituted this year.) I’ve filled my door and the window next to my door and half of the window above my door—but I think I have enough space left for the last 6 weeks of the school year! Do I expect everyone—even all my students—to love Shakespeare, word play, and books the way I do? No. But I invite them to give it a try and see if they do! Because if you love something, why not let it show? My students get to know me, my family, my excitement about what I teach, that it is possible to be excited about those things, and that it’s okay to be excited about what you love—whatever that may be. How do you let your inner nerd show?